Doctors prescribe tablet for Pateley Bridge man. Pateley Bridge town councillor Antony Brown has received a tablet of a different kind in a prize draw run by a local consortium of doctors. Mr Brown, who also works as a bar manager at the town's Crown Hotel, took part in a survey which asked local people for their views about extending access to GP appointments in the Harrogate and Rural District area. "As a federation of GP practices, we are about to open new hubs in Ripon and Harrogate that will mean people living in our region will be able to access extra routine primary care appointments later in the evenings and at weekends. We took the information we learned from the survey into account when we designed the new service and have added more than 70 hours per week to the currently available total of appointments across the 17 practices in our federation. We are now working with practices in the rural district with the aim of bringing the service more locally to their patients in the New Year." "In rural areas, people need different services than people living in large towns, and it is important that we all have our say to make sure we get the right solution for us. I understand that there will be more opportunities for people in Pateley Bridge and the surrounding villages to get involved with this project and as a local elected representative I'm looking forward to finding out more." 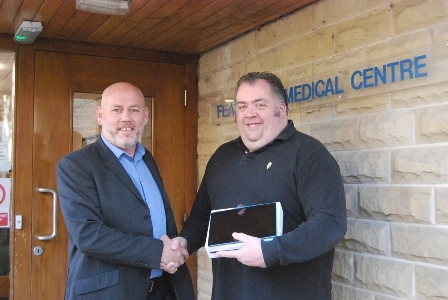 Picture shows Andrew King of the Yorkshire Health Network presenting the tablet prize to Antony Brown at the Feast Field Medical Centre, Pateley Bridge.